Carbonara: fettuccine/basil/pancetta/egg foam/local ramps/duck confit – It was certainly good, but not mind-blowing. Creamy comfort food. I didn’t get much basil flavor. The egg foam was a little unimpressive but added plenty of richness. Angus Flat Iron Steak: fingerlings/pickled red onions/spinach/lemon mustard vinaigrette/sriracha maple – The steak was perfectly cooked. The spinach was great too. The roasted potatoes were unusual with the sweet-spicy glaze, but the dish really worked. House smoked duck breast: mole/orange-fennel salad/sesame seed brittle/salty peanuts – Wow, this was sensational! The duck was cooked beautifully and sliced thinly, stacked high and topped with a little fennel. I loved the mole, and the fact that it was just a smear on the plate. The tiny piece of brittle and the few peanuts were just right too. This was an artfully composed plate whose components really came together wonderfully. This dish also came with a few roasted fingerling potatoes as well, which I thought were unnecessary. Overall, a bit pricey but undeniably delicious. In the gritty River Arts district, serving up very non-traditional tacos. We tried the bangkok shrimp, the gyro taco, the carnitas, and the chicken BLT taco, as well as some chips and salsas. The tacos were, without exception, excellent. The shrimp were fried popcorn style with a mustardy-sweet glaze and cucumbers. Pretty addictive. The gyro was just like you’d expect, but done very well. The carnitas taco was also good, with a unique bbq sauce. I felt it was a little much with pinto beans mixed in to the substantial filling. The BLT taco was really good too – fried chicken tenders, some mayo, and shredded lettuce, plenty of bacon shards, and tomato. The chips came with a trio of salsas – green, sour cream/red hybrid, and red. It was way too much salsa, but each was good. I would definitely make it a point to return here next time I’m in Asheville. This place fulfills the true potential of a place like Cary’s Taqueria Del Sol, and adds on to it with a funky vibe and charming atmosphere. Bocadillo serrano: the pinnacle of ham & cheese sandwiches: crusty baguette, jamon serrano, sliced manchego, a little crushed tomato, and olive oil. So so good. Gambas al ajillo : a little overpriced at $11 for a handful of shrimp. They were cooked very nicely, but the white wine broth at the bottom of the bowl was too salty to even consider dipping bread into. Tortilla Espanola de Chorizo: totally different than a similar dish at Durham’s Mateo. This was was a small “skillet cake” of a hashbrown, with caramelized onions, cheese, bits of sausage. Good but not amazing. Eggplant: Delicately battered slices of eggplant, fried and topped with rosemary and honey. Really delicious; one I’ll be attempting to re-create at home. Dan, one of the founders, told their crazy story and led us around the place. It was fascinating to see the operation. They are doing great things from a sustainability standpoint, and it was really impressive how homegrown the operation is. You get to try plenty of chocolate samples at the end of the tour; my favorite was the smoked black tea/sea salt variety. Only in Asheville? An entire shop dedicated to homemade potato chips. They have all kinds of crazy flavors. We went with a cone of “the Parisian” – herbs/feta/truffle oil. I have to say I was a bit unimpressed. Asheville’s famous little cafe which is now a chain, and it looks and feels like one too. I went primarily for their famous sweet potato pancake, and it did not disappoint. It was huge and really nicely spiced, topped with some peach butter and pecans. I preferred it without syrup. The other food we had, including the three enormous biscuits they bring out with each meal, were pretty average. We went after the chocolate tour and chip adventure, so we weren’t all that hungry. This is a cute little cafe with a line waiting for the place to open. They serve Indian street food. We tried some very good samosas, and some naan with daal and raita. And a mango lassi too. Everything was delicious in our limited sampling. 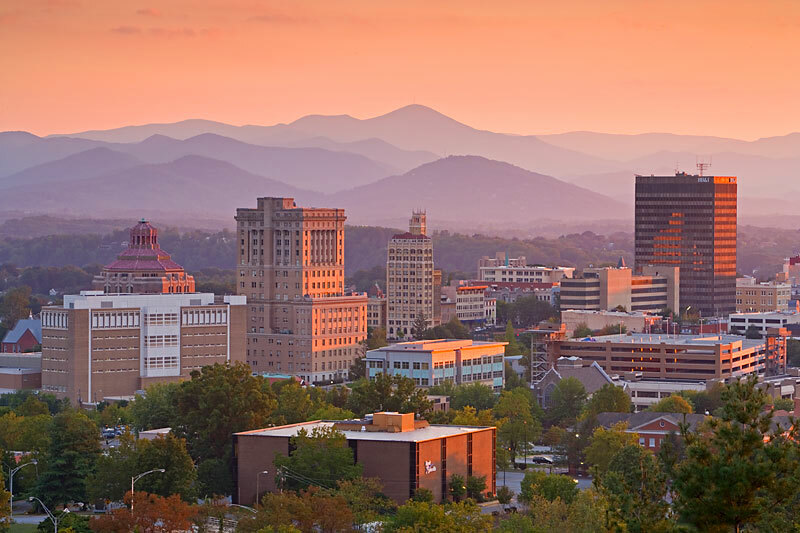 Asheville is a great city for eating (and other things too!). There were tons of places on my list which we didn’t get to, but we spent plenty of money and probably put on a few pounds, so those will have to wait until next time!